Meet KozoMan. 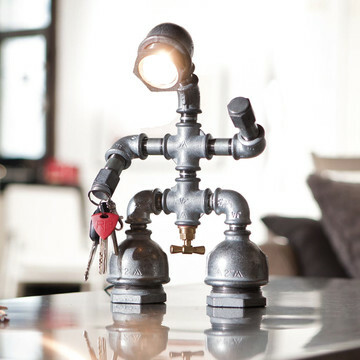 He is a desk lamp and he’s thoughtful – with magnetic hands to hold your keys and little padded feet so he doesn’t scratch your desk. And if you’re meant to be working or studying, I think he looks a little threatening, almost like he’s saying, “you think you’ve earned a break already, do you? DO YOU?” But you retain control, and can dim KozoMan’s light by turning the tap light switch. Perhaps you don’t have a very big desk space and you need something even smaller. 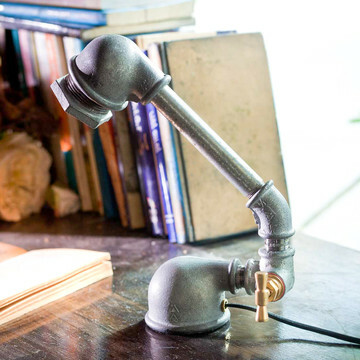 If so, you might want to consider the Mono desk lamp. I can’t get past the fact that it looks sort of like a lamp being tortured or cramping over in pain. Though maybe that’s just me reading too much into an angled pipe attached to a low base. Maybe. These are just three of the amazing Kozo Lamps (photos from Fab.com) and you can check out more of the range on the Kozo Lamps website here. I love them ( although the mono lamp does look like it’s squatting for a bodily function). I once knew a three legged dog called Wilf and I think he would approve. 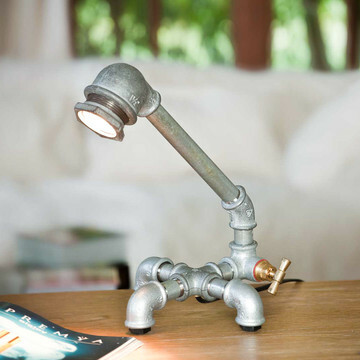 I am not really a ‘stuff’ person but I think I want one of these and it would appeal to DDs llove of meccano and the like- thanks for bringing them to my attention. Heya Sparks – How are you, my blog buddy? Kozoman rocks! Shame I didn’t discover him in time for LM’s birthday. Ah well – always next year!